03/09/2012 Lesjöfors have a reputation for producing springs of the highest quality. In order to meet customer's expanding requirements, Lesjöfors have invested heavily in new equipment capable of measuring and documenting the characteristics of individual springs automatically during production. Lesjöfors produce springs for a wide variety of industries, with wire diameters of between 0.03mm and 65mm. 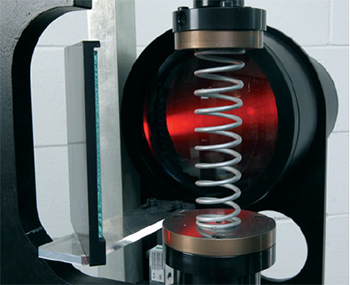 The characteristic of each spring can be calculated accurately using theoretical models, combined with Lesjöfors' extensive knowledge of performance-enhancing measures including heat treatment, grinding and shot peening. However, with the integration of state-of-the-art measuring equipment into the production line, Lesjöfors can automate continuous inspections during the production process, ensuring that each spring exactly matches the required characteristics. The new equipment has been supplied by MicroStudio of Italy, which specialises in measurement solutions for spring manufacturers.